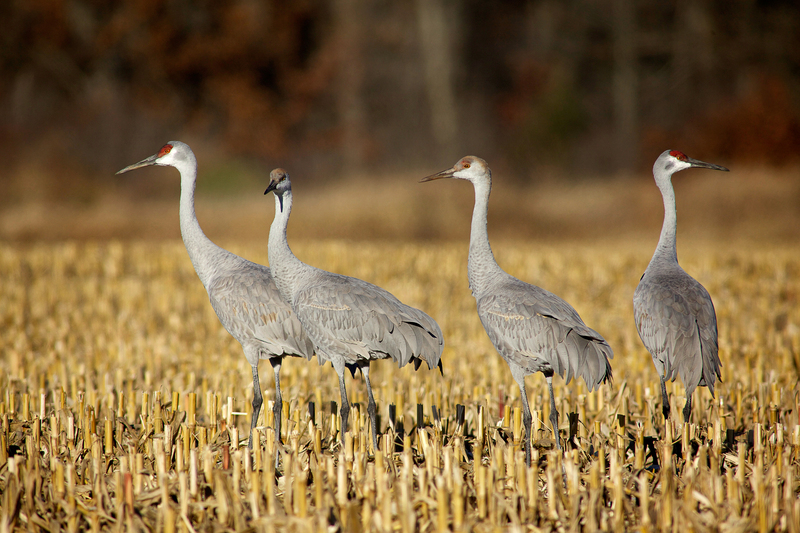 The International Crane Foundation closed for the season on Friday, October 31st. The Whooping Cranes who live there have a beautiful exhibit, which includes a substantial wetland where visitors can sit, reflect on the plight of the species and realize that there is hope for the world’s rarest crane to recover from a brush with extinction. 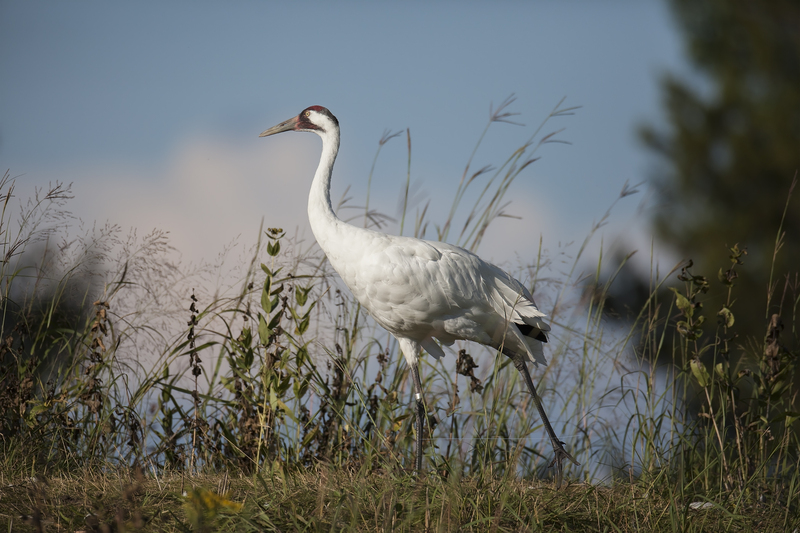 To learn more about the history of Whooping Cranes, visit ICF’s website – savingcranes.org This Whooping Crane, called Omega, hatched from the last egg to be collected from a nest in Wood Buffalo National Park in Alberta/Northwest Territories, Canada. He hatched at ICF in the late 1990s and has been in the exhibit with his mate, Seurat, for the past three years. Click on the image for a larger view. Photo by Ted Thousand, ©2014. 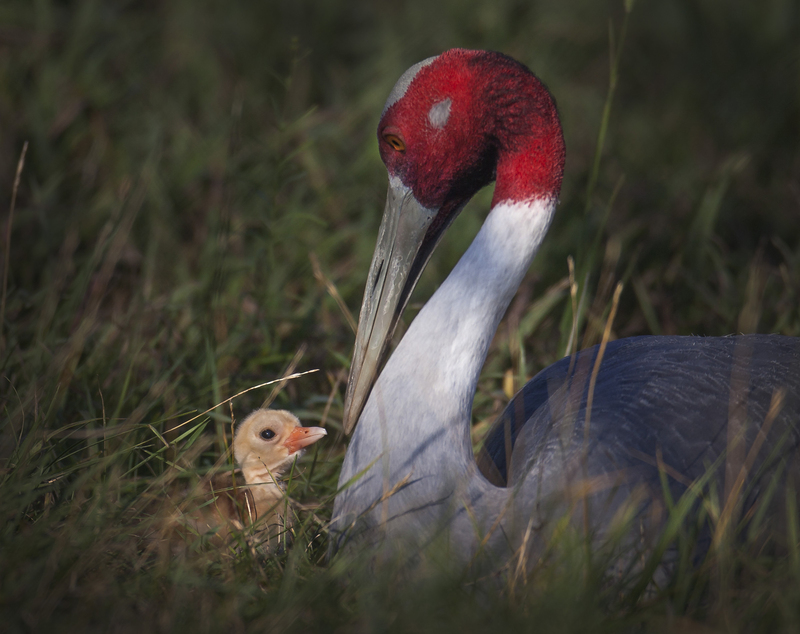 On Monday, August 18, 2014, a rare Sarus Crane chick hatched at the International Crane Foundation (ICF). The proud parents are Majnu, a 51 year-old male who was captured as a young crane in India about 10 years before ICF was founded, and Chandini, a female hatched in 2002. As a wild hatched crane, Majnu is considered a founder. This is an extremely desirable designation in captive crane populations – in all captive animal populations, actually – as genes from these animals are mostly underrepresented in the captive population. To learn about Species Survival Plans (SSPs) and how zoos and aquaria use genetic management to support wild populations, visit the AZA website. Chandini watches over Curry the chick just 1 day after hatching. Curry at 5 days old is getting around his exhibit quite well. All photos by Ted Thousand. ©2014 All Rights Reserved. Sandhill Cranes migrate in family groups, such as this pair with two juveniles! Cranes lay two eggs each season, but often just one chick will survive to fledge and then migrate south with its parents. When food is abundant and the parents teach their chicks good survival skills, both survive and become healthy adults. Click on the photo below for a larger image. The youngsters are distinguished by the lack of bare red skin atop their heads. As they molt and get their adult plumage, the red patch will become more and more visible. By next spring they will look just like their parents. This year a new technique for reintroducing endangered Whooping Cranes into the wild was added to the tool chest. 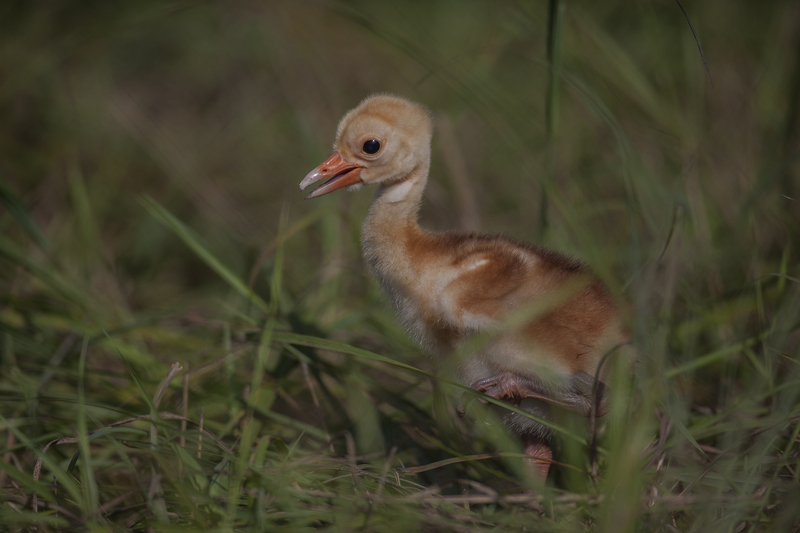 A parent reared chick (24-13) was raised at Patuxent Wildlife Research Center in Maryland. This juvenile was released at Necedah NWR near the territory of an adult pair (2-04 M and 8-09 F) that did not have a chick this year. They accepted the young bird and the three have been together ever since. Ted caught a glimpse of the new family near the International Crane Foundation in early November as they fed in the agricultural fields along with the more abundant Sandhill Cranes. At 47 years old, Nandi is one of the oldest cranes living at the International Crane Foundation (ICF). She has a scar on the top of her head from traveling in a crate that was too small for her almost 6 foot tall frame. Years ago zoos, private breeders and collectors had little oversight when capturing wild animals for exhibit. Nandi eventually landed at a zoo in the Midwest and then ultimately came to ICF in hopes that she could be bred. Breeding of endangered animals already living in reputable zoos and facilities helps to alleviate the demand for taking the few remaining individuals left in the wild. Today just 7,000 Wattled Cranes are thought to make their living in the river deltas of sub-Saharan Africa. Nandi can be seen at the International Crane Foundation in the Spirit of Africa exhibit every day from April 15th through October 31st. 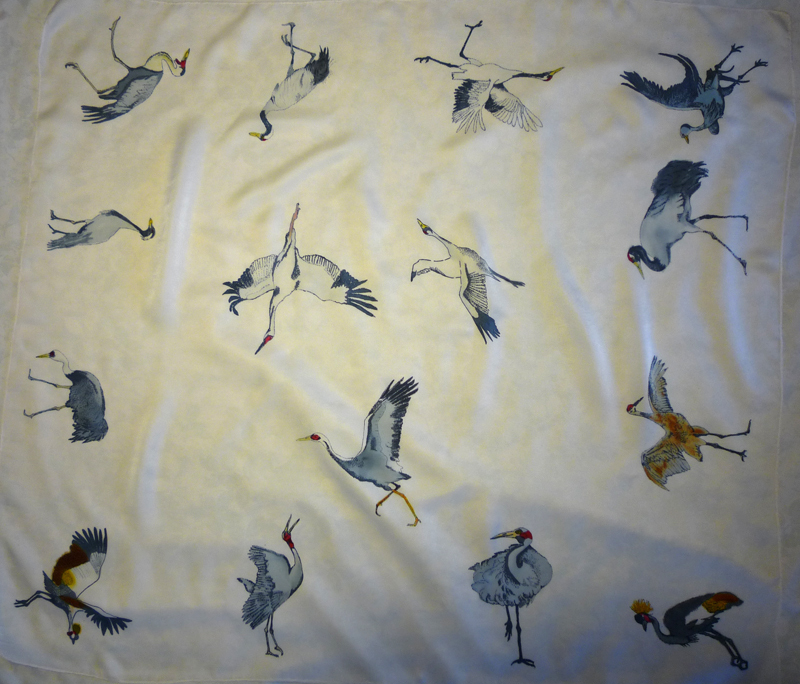 The International Crane Foundation is the only place in the world to have all fifteen species of cranes on exhibit. To learn more visit http://www.savingcranes.org. As in many parts of the country, Wisconsin experienced one of the worst droughts on record last year. This year, early rains reawakened the flowers that were dormant last summer. Ted explored the prairie at the International Crane Foundation and got some beautiful photos of these tenacious plants. Many of the grasses and forbs reach heights of 6 feet or more, but the roots may be 2 or three times longer than what wee see above the soil’s surface. This adaptation helps such plants survive lengthy periods of drought and even fire. Yellow Coneflower (above), Culver’s Root and Prairie Blazing Star (below) paint a colorful landscape. Both photos by Ted Thousand. All rights reserved. International Crane Foundation Co-founder, Dr. George Archibald, established a unique relationship with a genetically valuable Whooping Crane named Tex in the mid-1970s. Tex was imprinted on people because she had been hand raised by the Director of the San Antonio Zoo. We created an exhibit this season at ICF to tell the story about how this effort aided in bringing the Endangered Whooping Cranes back from the brink of extinction. In the 1940s, only 21 of North America’s tallest birds were alive on the planet. Only 15 would contribute to the genetic pool resulting in the 573 Whooping Cranes we have today. This includes both wild and captive birds. To learn more about the exhibit and ICF’s work check out George & Tex. For a special treat, go to ICF’s new CraneTube Channel on YouTube and watch Dr. Archibald tell the story of Tex and her only offspring, Gee Whiz, in his own words. I am back at work, part-time, getting ready for the season to open at the International Crane Foundation. My department is charged with getting the site ready for the more than 25,000 people who visit between April 15th and October 31st each year. They come to see all 15 species of the world’s cranes (only place on earth) as well as walking our trail system through ecologically restored oak savanna, prairie and wetlands – all critical environments not only for cranes, but people and many other species. 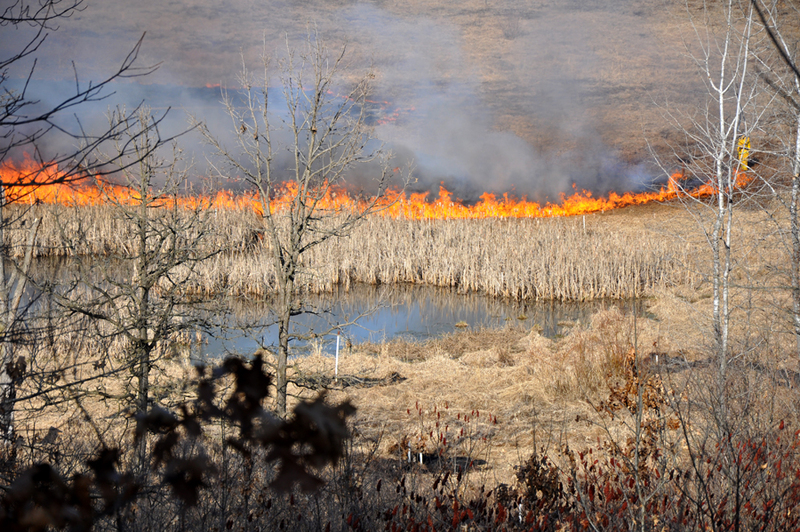 At ICF, an important tool in restoring these ecosystems is fire. Prior to European settlement in this area, natural fires kept these environments healthy. 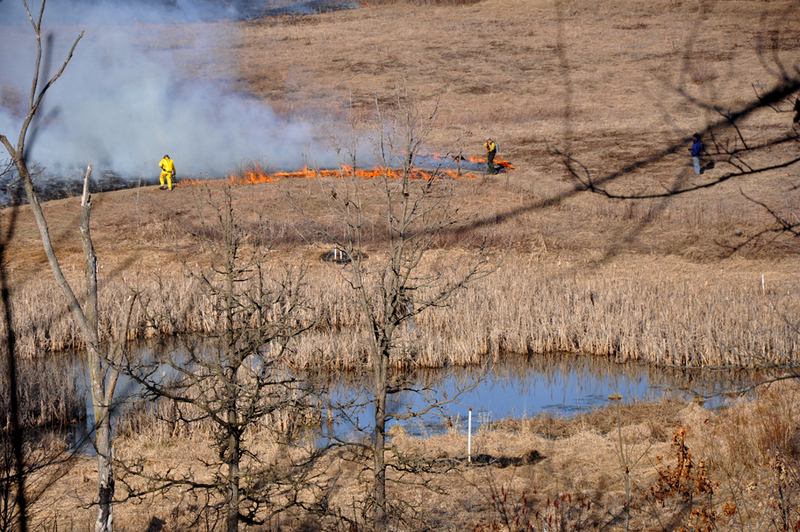 Today, prescribed burns are conducted to encourage native flora to thrive and eradicate – as much as possible – invasive, or non-native species. 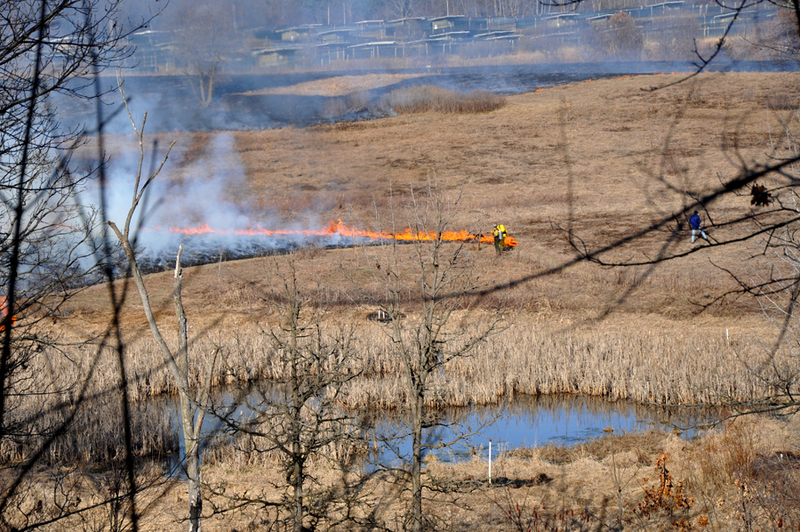 A 35-acre burn was conducted in the restoration area at ICF’s headquarters in Baraboo, Wisconsin. 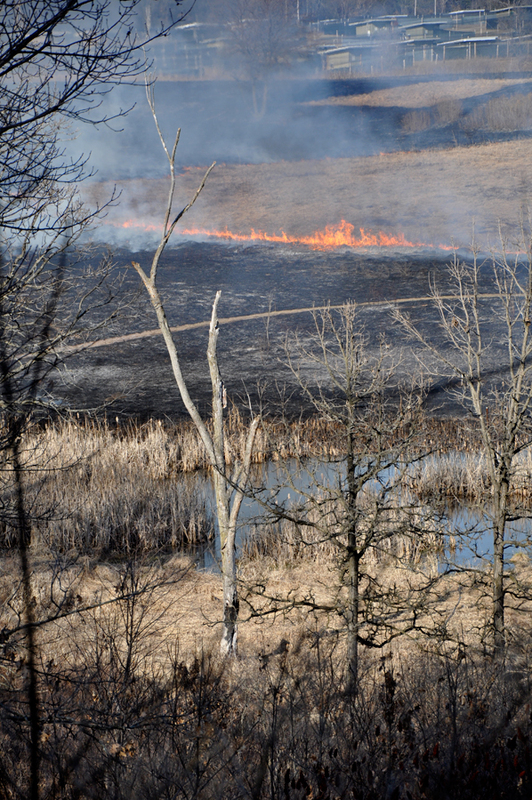 The entire restoration encompasses 100 acres and burns are conducted on a rotating basis. 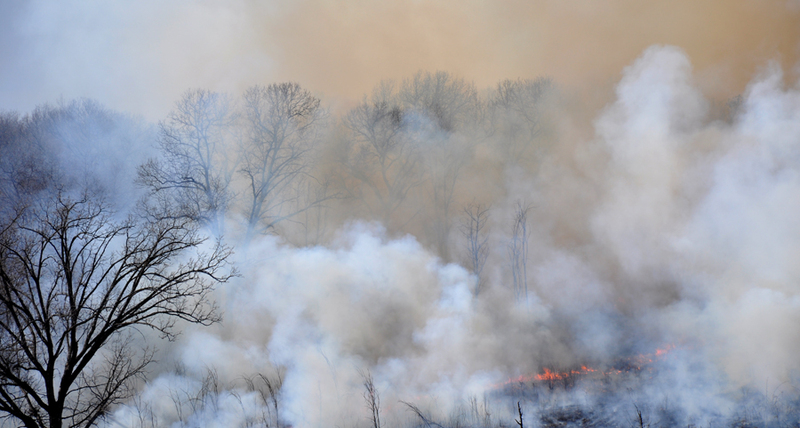 Some areas are burned every three years, others every five, and so on. Results gathered from observations of these areas not only inform how this area is managed, but also help ICF’s scientists restore vital ecosystems around the world where field work is being conducted to save some of the most endangered species of cranes including Sarus cranes in Vietnam, Whooping cranes in North America and Black and Gray Crowned cranes in Africa. The following pictures were taken March 26, 2010 as ICF staff, interns, volunteers, family and friends participated in a prescribed burn in the prairie, wetland and woodlands. The next step for this particular scarf is to paint a background. I am leaning toward a very light blue – my perception of sky blue – to complete this project. Coloring in each bird took a bit longer than I expected. Future versions will probably be modified to make them more affordable for people and easier for me to produce. You can click on this image to see a larger version.